Northeast Oregon has some of the West's great, undiscovered fishing areas. The Grande Ronde is one of Northeast Oregon's most productive steelhead and trout fisheries. The Imnaha is a fast-flowing, freestone river in spectacular basalt canyons. The Wallowa is a small, floatable river which flows through the heart of the beautiful Wallowa Valley is a rich freestone river with choking hatches of caddis flies. Trout fishing in northeast Oregon this year during June has exceeded all expectations. June is always a productive month to fly fish local rivers and consistently produced fish over 15 inches, but this month more than half of the fish hooked have been 15 inches or larger. These results are not precisely predicable, but they are not a surprise either, they are simply what I always hope for. Our dry winter and thin snowpack did not produce any substantial runoff during May and June. For most of that period the rivers were at about half of average flow. The benefit is that many more of the anadromous strain of fish remain in the rivers as "trout" and predicably gives us great fishing, although the size of fish available during any given year varies considerably. Fishing results this month are a harbinger of excellent fishing through the remaining summer months. 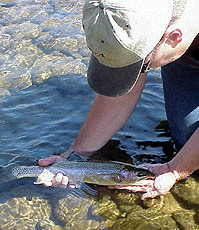 Eagle Cap Fishing Guides will take you fishing in the Grande Ronde, Wallowa, Imnaha, Minam and Wenaha rivers, or alpine lakes in the Eagle Cap Wilderness. Join John Sullivan and Orvis Endorsed Guide Mac Huff on a day to a week fishing adventure for Pacific steelhead, rainbow trout, bull trout, and smallmouth bass on one of writer Zane Grey's favorite rivers. For the adventuresome, Eagle Cap Fishing Guides also offers guided fishing trips on many of Wallowa County's smaller and more isolated streams -- Bear Creek, the Lostine, and Minam -- as well as float tube, horse pack, and fly-in trips into the Eagle Cap Wilderness. After which you are able to hike to numerous "Hot Spots" in the Lakes Basin, which is a breathtaking series of more than 20 alpine lakes high up in the Wallowa Mountains. Learn more about Eagle Cap Fishing Guides and our scheduled and custom trips on the web by logging into: www.eaglecapfishing.com. Or, contact us at 1-800-940-3688.